Hey! You have lovely dimples. I bet you are a Libran. Hmmmm. I can never be wrong with that one. I can identify a Libran hands down. Well, well, well, there seems to be a connection of a deeper kind in today's world of making friendships. We as students had specific points of connections as the same place of birth, growing up in similar localities, parents working in the same offices, or mothers who were in same hospitals while giving birth. Today the sphere of making friends has acquired another new addition - Star signs. And if star signs were not enough, there are moon signs, Chinese horoscopes - which have years like Tiger, Boar, Monkey, etc., and other similar modes of connection. After meeting a new person, the eternal star finder gives some time to the conversation and slowly drops the all-knowing power of her Linda Goodman almanac. Hmmmm. So are you a Capricorn? You appear to be very stern and a person of few words? Or else its a "Your element must be earth." If the person at the receiving end is as inquisitive as the speaker then the atmosphere is something that resembles "the charge of a light brigade" but if its the other way round then "Earth what?" "Aquarius - is it something to do with water?" Almost all the dailies irrespective of their quality of giving news provide daily predictions which are lapped by again almost every section of readers (especially adolescents and 20's). Linda Goodman's books are a hot favourite when the college-goer starts her romance. Women especially relate to the compatibility guides offered by voluminous books that can very well be substituted for a pillow if you don't mind the hardness (!!!). Capricorns are compatible with . . ., Scorpios with . . . In fact I have had several encounters with my fellow passengers while traveling who strike up a conversation and when we find that we are getting on well like a house on fire, the question is dropped: "Are you a Libran? I ask because you talk a bit too much like me." Well I do talk much and am a Libran as well but my friend who is a Gemini also talks a bit too much. Points of connections are interesting as they are diverse and multi-ranged but then there is also a danger of compartmentalising these points. I can be a Libran but that should not stop me from judging another person whose sun sign is not quite compatible with mine. So are you a zodiac buff as well. Share your star-struck experiences and lets laugh together. After all, the science (or art) of astrology and the way the planets guide or direct our lives have been around for millenia, so something of it is probably true. Zuzana: Quite well said. It holds true that many things told about a particular star and the qualities are almost right. Ashes: So long. AB might be talkative with non-talkers. When I meet talkative people, I don't talk much. So much so . . . I've had my dabblings in the world of astrology. I've read every one of Goodman's books, I've had my birth chart done for me, I've done birth charts for others... etc. In fact, there was a time when my friends and I had astrology parties, just to have fun with the whole thing. But then, you somehow get carried away with it all. I started to feel like every time I met someone, I would ask myself, before anything else, what their astrological sign is... which is entirely ridiculous. So, I stopped my hand and went out in search of science and a possible explanation for astrology - and, of course, found none. Now, the two are extreme opposites of one another, so I should not have been attempting to prove or disprove one using the other. However, I needed something to stop me in my tracks and that did the trick. And yet, my husband is a Libra and he does have dimples, yes. But so is my best friend, and she doesn't have dimples. But what is the likelihood of having a husband and best friend share the same sign? Coincidence or astrology? I'm a Pisces and I do tend to look at the world with dreamy rose-colored glasses, but then sometimes I go the extreme opposite way and use reason and objectivity. I guess I'm now of the school of "Have fun with astrology, exclusively fun." What an interesting topic for a post, Susan! Dear Nevine: What I admire about you is the patience with which you comment. A detailed comment with observation, life-examples and appreciation. I must say that you have mastered the craft of commenting. I am fortunate to have many such readers who weigh their words and use the choicest lines of admiration and encouragement. I enjoyed reading your stint with the Zodiac. I guess all of us go through that: First a crazy adulation, then a timely consultation and then the fun element. I am glad that I share the sign of your husband and friend. It would not be an exaggeration to say that Librans haunt you everywhere. They are lovely people! Now there's company when you say: "Have fun with astrology, exclusively fun." Thanks for coming by and sharing dear Nevine. Peter Vidal - Times Now!!! ha ha. Oct 1st is the day dear Ash. I know yours from the Orkut page. Hmmm. Too much belief is prone to addiction and obsessive compulsive disorder towards the stars!!!! Cyrus: Glad to see your comment. Perhaps you should . . .
Ashes: We are buddies now officially on ORKUT. Yay!!! Post and comments have been so interesting to read.. I'm a Leo but somehow, I don't see that the disposition follows. He hee hee... 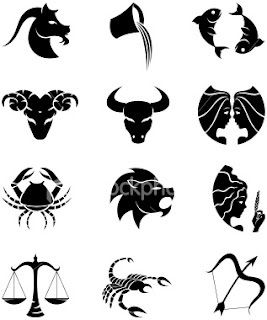 I am a Zodiac buff too...!!!!!!!! I am a Capricorn. I am totally the girl you can read Linda Goodman "Capricorn" and get to know 80% about! This is the essence of the Gemini personality and I try my damnedest to live up to this traits lest I let down some poor soul who has taken pains to caricature me. Am I like this because I am a Gemini or is it because I read this is how a Geminian should be? I don't know. Figure it for yourself. BM: Thanks for that lovely comment. I appreciate your visits. Sameera: Fun, it is. My sister also shares the same sign as yours. Govind: The quintessential Gemini. My god! you actually wrote all that qualities. Hats off to you!!! Thanks Govind. Happy Pongal to you as well. I am a Gemini, fickle, undecided and all that G had said. Whatever that has been said of this star sign is absolutely true. Whatever said and done, you are Gaia, the all-knowing. Joy always. I value your visits here.